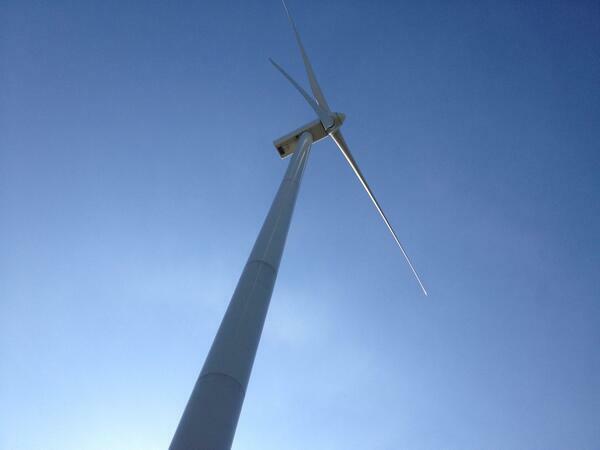 A turbine stands tall at Blue Creek Wind Farm in western Ohio. Andre Porter resigned as chair of the Public Utilities Commission in 2016. 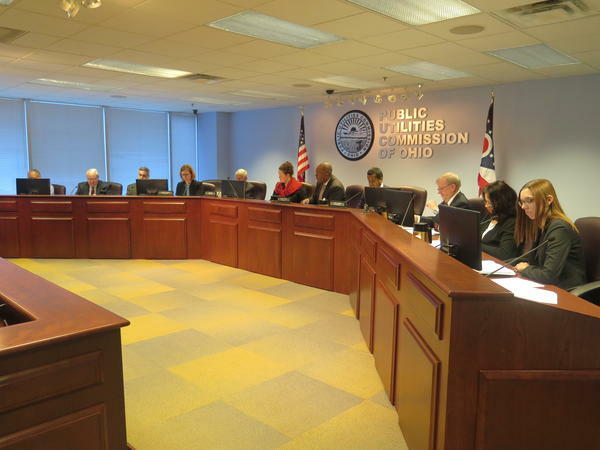 The Public Utilities Commission of Ohio votes in March 2016 on the power purchase agreements for FirstEnergy and AEP. 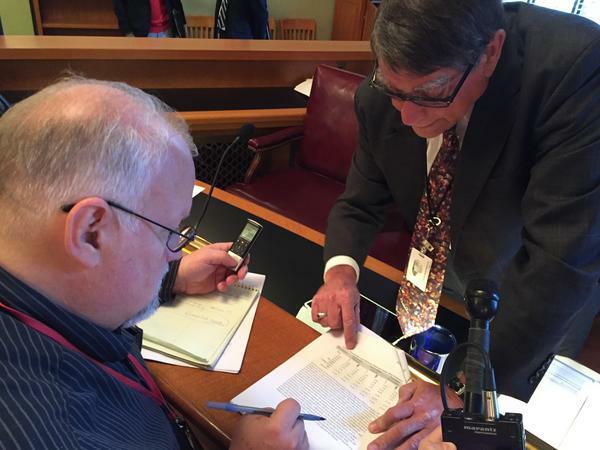 Sen. Bill Seitz (R-Cincinnati) explains some specifics of energy policy to reporters. 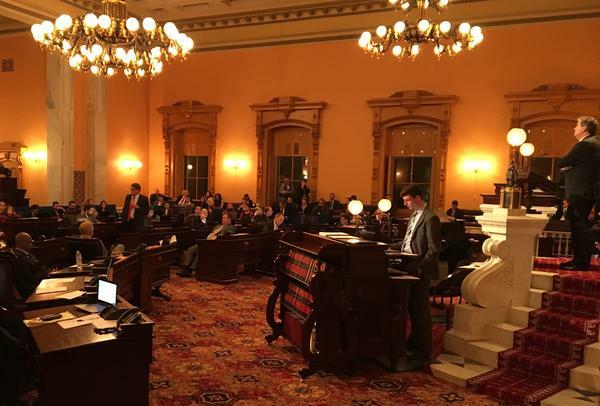 The Ohio Senate debates the state's green energy standards during the lame duck session in December 2016. Two of the state’s biggest electric utilities started the year by introducing a new term – “power purchase agreements”. They were a big deal to a lot of energy industry insiders, but soared over the heads of any typical ratepayer. That was, until opponents started calling them “coal plant bailouts”, and noting that those agreements included fees added to electric bills that would help fund struggling coal plants that were not performing well in the energy market. FirstEnergy and AEP were the first to seek such agreements and fees. Pablo Vegas, the now departed president of AEP, said this plan would keep coal plants operating and avoid higher energy costs. “We don’t want to see that kind of price shock. So we think that having a gradual transition away from coal is a much more responsible way to do it because it’s going to take time to build its replacement,” Vegas said. 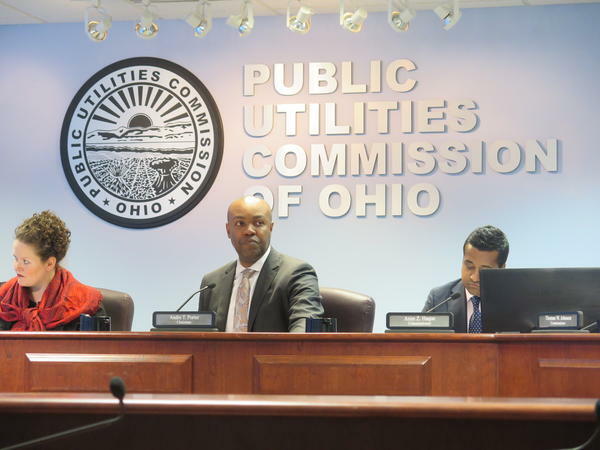 The controversial proposal was passed by the Public Utilities Commission of Ohio but federal regulators stepped in and blocked the agreements. That sparked another big issue in the world of energy: re-regulation. AEP was the first to suggest that, without assistance to prop up coal plants, they would either have to sell off their coal generation or call for Ohio lawmakers to go back to a regulated utility industry. Sen. Bill Seitz (R-Cincinnati), who has been around since Ohio started the deregulation process in 1999, said it would be hard to put the toothpaste back in the tube. “There are a great many of new players in Ohio as a result of deregulation that were not here in 1999. They are going to -- I think -- cry foul at any attempt to re-regulate that would inhibit their ability to be a competitive supplier," said Seitz. So far there doesn’t seem to be movement in an effort to re-regulate. So AEP has been going with the other option, selling several power plants and unloading its generation. FirstEnergy may soon follow suit. The northeast Ohio utility says it is looking into several ideas which includes selling its power plants. All year, the clock was ticking for state legislators to figure out what they wanted to do with the state’s green energy mandates. 2016 was the last year for a freeze on the requirements on utilities to increase their use of renewable energy. If lawmakers did nothing, those benchmarks would be reinstated. Many Republicans have called those standards “mandates”, and favor goals instead. At the last minute, a bill was passed to pause the requirement of those standards for two years. Democrats didn’t like the bill and even some Republicans were opposed. Sen. Cliff Hite (R-Findlay) said it closes Ohio off to green energy development. “I thought we were open for business people. That’s what we said, we are open for business and that has not been the case all the way not with a freeze -- people are going other places and they are,” Hite said. But Gov. John Kasich, a supporter of strong standards, vetoed the bill. Ohio also ended the year with an empty chair on the PUCO. The Senate rejected Kasich’s nominee, Howard Petricoff, who was involved in the coal bailout case earlier in the year. Senate President Keith Faber (R-Celina) insisted the rejection was not a personal jab at Kasich. "This isn’t about the relationship between Keith Faber and John Kasich, it’s not the relationship between the Senate and the governor, it’s not even about the relationship between the Senate and Howard Petricoff. This is about the constitutional process and this transcends personal issues,” Faber said. With all that has happened this year, there are still plenty of issues that could likely come back for debate in 2017. That includes the idea of increasing the tax on oil and gas and yet another attempt to repeal the green energy standards.